Now that the holidays are over and everyone has opened their gifts, I can belatedly show you what we gave the grandparents – my mom and his parents – for Christmas this year. I wanted to do a ‘baby’s first ornament’ for each baby, but couldn’t find anything that wasn’t silly when I was shopping. So I started haunting Pinterest, like you do. There were a lot of recipes for salt dough. But then – lo! A really cute idea, from a fellow twin mom: photo block ornaments! Here, roughly, is what I did: I bought two-inch wooden blocks from Michaels and painted their edges with some spare black paint I dug up from one of the drawers in my craft room (I have started a LOT of projects, is all I’m saying). I found a representatively cute picture of each baby and sized it to 2×2 in Photoshop (if you don’t have Photoshop, everything I did is do-able in other programs, I promise). Then I hunted down some cute backgrounds and Christmas-y fonts – this was probably the most fun part and I might have downloaded way more fonts than I needed – and made some more 2×2 squares, one with each baby’s name and the year, and one with just each child’s initial. Finally, I scanned in their wee baby footprints from the hospital and sized them to 2×2 as well. In our mixed-faith household, we take the opportunity to celebrate lots of holidays. Specifically, we celebrate both Hanukkah and Christmas around here – which means there’s a lot of present shopping to do! To make our shopping list manageable – and try to make sure our children don’t turn into spoiled monsters – we agreed on a Hanukkah budget: eight gifts, but each gift can only cost ten dollars or less. Larger gifts are put under the tree for Christmas. I have bought Hanukkah gifts for my husband for years (I will freely admit that it started out as the rankest bribery to get him to participate in the holiday, though I continued long after he was happily settled into our mix-’em-up lifestyle). This year, though, we welcomed our twins – and I had sixteen more small, inexpensive gifts to buy. It was harder than I expected it to be – babies don’t have hobbies! So I’ve put together this list of some of the things I got, as both Hanukkah gifts and stocking stuffers – they tend to be the same sort of thing in our household, little gifts. This list is intended for babies between six and twelve months old – our twins are ten months old at this writing, but have used some of the things on here for a few months. If you’re still looking for some last minute stocking stuffers, I hope this list can help you out! 1. First Years Massaging Teether: This is currently my daughter’s absolute favorite toy. While she was (painfully, agonizingly, loudly) cutting her first three (!) teeth, chewing on this thing was the only thing that kept her happy. Now that the pain is over, she still loves it, and will chew on it and rock gently like a tiny serial killer. 2. Puffs: By 6 months, your baby is probably starting solids! Once they’ve mastered the pincher grasp, they’ll devour puffs as fast as you can put them down. We save them for a periodic treat – or a distraction for photo-taking – as they don’t have much in the way of nutritional value. Bonus: if you check the grocery store during November and December, they often have adorable holiday packaging. Ours have little penguins in scarves on them. 3. Num Num Dips: Whether you’re doing baby-led weaning or traditional purees, this spoon is a great tool to help your baby learn to self-feed. It has shapes for messy food to cling to, so it won’t simply slide off when your baby turns the spoon in every direction. Bonus: the tip is silicone, and boy do babies love to chew on silicone things. 4. Safety First Finger Toothbrush: As soon as baby gets a few teeth, it’s time to start making sure they stay clean. A finger toothbrush is great, and a fun gift. This one also has a ‘gum stimulator,’ and comes with a storage case which we will probably lose by next week. 5. 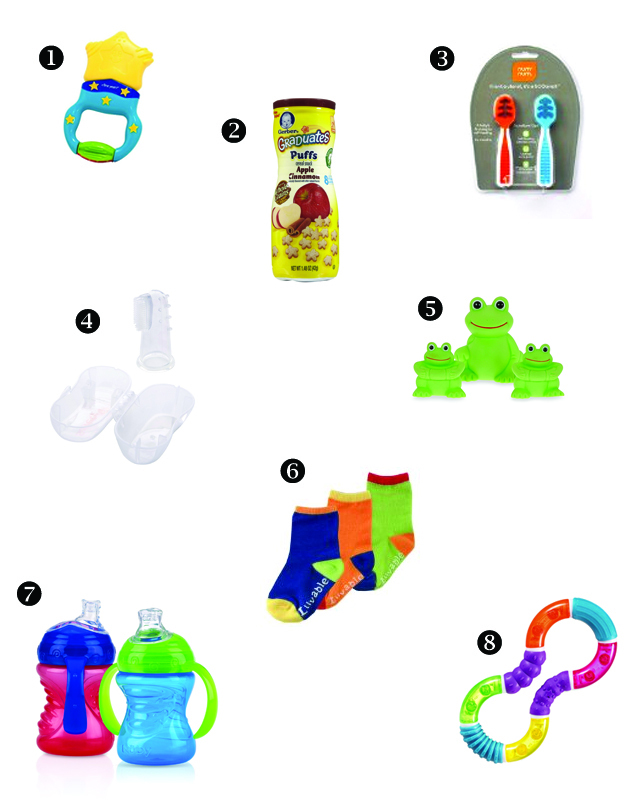 Rubber Frog Family: Rubber duckies, froggies, and other bath time friends are great small gifts. We gave one twin a set of ducks, and the other a set of frogs. Soon our bathtub will be host to armies. 6. No-Skid Socks: If your baby is anything like ours, they are on their feet as much as possible. Whether they’re pulling up, cruising, standing, or walking, a cute pair of socks (or three) make a fun gift, and the no-skid bottoms will help with their stability. Bonus: Babies also like to chew on socks. FYI. 7. Nuby No-Spill Sippy Cups: We were shocked at how quickly our babies were able to grasp how to use these. It took them all of two days to be tiny sippy cup masters – they went from chewing on the spout confusedly, to lying on their backs drinking (and occasionally spitting in the air like little fountains, for fun), to figuring out how to tilt the cup back while sitting up. 8. Munchkin Twisty Teether: You can never have enough things for babies to chew on, let’s be honest. This one also lets them twist and manipulate bits of it. Disclaimer: All Amazon links on this site are now affiliate links; if you purchase something I’ve recommended after clicking through from here, a tiny bit of money happens to me.